Treasure Beach Hotel is an intimate hideaway set in glorious, tropical gardens at the edge of a turquoise sea. Manicured lawns extend down to a magnificent mahogany tree onto a perfect white sand beach. This enchanting resort nestled on the west coast of Barbados provides the perfect setting for a wedding, honeymoon, or a much-needed vacation to relax and unwind. 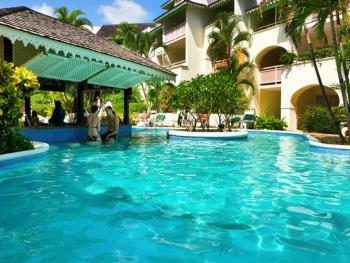 Treasure Beach Hotel is an intimate hideaway set in glorious, tropical gardens at the edge of a turquoise sea. For those interested in shopping, the 'Holetown Shopping Plaza' is located within walking distance. 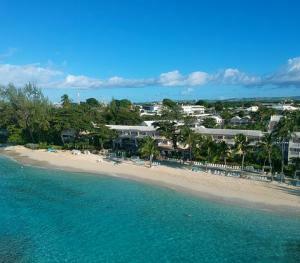 Treasure Beach is in easy access to all attractions that the island of Barbados has to offer. Golf can be arranged at Sandy Lane less than 5 minutes from the hotel. Horse back riding, hiking tours, island safari's, and sight seeing tours can also be arranged. Snorkeling, scuba diving, sailing, and fishing are available. Every suite has an air-conditioned bedroom with ceiling fan, bathroom with hair dryer, tub and separate shower. A tastefully furnished living room, with ceiling fan, leads out to a private patio or balcony. Home comforts include a well stocked bar with fridge freezer, toaster and kettle. If you feel energetic there is an air-conditioned fitness suite that has the very latest hi-tech equipment including a heart monitor treadmill, bicycle and step machine and satellite television. The hotel has a lounge with wide screen television, complimentary DVD, video and satellite - watch all the major sports events in the comfort of the air-conditioned lounge with rum punches on request. The lounge also has a well-stocked library, a selection of games and free Internet and e-mail facilities. The freshwater swimming pool is the focus of attention with many of the suites, dining area and bar forming a horseshoe cluster around it. The lush, colourful gardens add to a tranquil tropical setting. All guests are encouraged to select their chosen activities and the hotel will be pleased to make reservations. Transfer from and to airport in a limousine, welcome drink on arrival, complimentary suite upgrade based upon availability at check-in day, a bottle of champagne in the suite upon arrival, a fresh orchid in the suite, daily full breakfast, complimentary cold facial towel and morning fruit kebabs, daily afternoon tea served around the pool, invitation to Managers Cocktail, one catamaran cruise including beverages per week, one relaxing massage for Her, gift from hotel for Him and car hire for one day, category A. Please note the car rental does not include CDW, gas, local driver's permit or upgrades. Package Price per week is US$729 inclusive of service charge and VAT. Upgrade of accommodation based on availability on day of arrival, wedding coordinator services, marriage license, transfer to Ministry of Home Affairs, bridal posy and groom's buttonhole, fees for officiating Minister, two witnesses at the ceremony (if needed), a one-tiered light fruit cake decorated with fresh flowers, a bottle of champagne for toasting, a la carte dinner for Bride and Groom on the wedding night, registered copy of the Marriage Certificate (will be mailed to home address should time not permit) and a gift from the hotel will be provided at a total of US$878.00 inclusive of service charge and VAT. Serves breakfast, lunch and dinner. The Al Fresco restaurant is an attractive split-level dining area with tranquil views across the swimming pool to the Caribbean Sea. The 'Gold Award' winning dining room features international as well as local cuisine. Dinner is served in the restaurant and around the pool under a starlit sky. The cozy re-designed bar with mahogany countertop and wooden decking invites guests for get togethers, tempting tropical cocktails or a glass of champagne. Local newspapers, chess and backgammon are also available.